More great Real Estate news for Lake Nona! Thanks to a ton of newer businesses in Lake Nona which means development and job creation as well as the opening and publicity of the fantastic medical facilities in Lake Nona, the area is on track for another record breaking year! Metrostudy, a market research firm tweakyourbiz listed Lake Nona as the most active local community with more than 400 new home starts over the past twelve months, double the Orlando metro area’s nearest competitor! Sales records for homes have already broken records with over 320 sales and over $100 million in new home contracts through July, thats just for the first half of the year! Over the previous 12 months there have been nearly 500 new homes sold with Laureate Park being the most popular and active neighborhood by far. In fact, they have 165 new contracts in 2013 alone! After all, what’s not to love? There are over 20 decorated models to tour at Lake Nona, with 15 at Laureate Park! Definitely worth considering for potential buyers. As just mentioned the other day, through the second quarter of 2013, the market research firm RCLCO identified Lake Nona as the fastest selling community in Orlando, and the 14th fastest selling community in the whole country! Thinking of moving to Orlando’s Medical City or the Lake Nona area? Or any other part of the Orlando/Central Florida area? Click here to search the Orlando Multiple Listing Service. You can also view our fantastic range of featured properties! Selling your home? Contact us for comprehensive home valuation services! Email Steve Glose here at steve@thefloridalivingteam.com. Or you can call direct on 407-616-7286. Orlando Medical City – Orlando’s up-and-coming Elite Community. Stop the press! – Great news for those living in Lake Nona and those considering to make the community their new home! Lake Nona ranked 14th in the country in sales through the first half of 2013 according to the RCLCO, a national real estate research firm. This is up compared to the previous release back in January where Lake Nona was only in the top 20 communities in the nation! Lake Nona is also now also the fastest selling community in the Orlando market. They say that Lake Nona’s sales at Laureate Park are currently selling at more than double the pace of last year. RCLCO has listed each year (since 1994) the top selling master planned communities of 2013. According to their data home sales in the top master planned communities were at their best since 2007. In fact, sales in the top 20 are over 37% higher in 2012 than in 2011. In Lake Nona however the figures were up 169% in 2012 compared to 2011’s sales data. They said this time that sales amongst Florida’s master planned communities continue to improve as the economy is strengthening and the housing market recovery continues. With inventory selling fast and prices nationally up 15% as we wrote about, now is the time to buy Lake Nona! This is exciting news for Lake Nona and for the Orlando Medical City area. As reported by the Lake Nona Blog, the Nemours Childrens Hospital in Lake Nona has been awarded the prestigious LEED® Gold Certification. This makes it the ONLY hospital in Central Florida with Gold. In fact, Nemours Children’s Hospital is one of only three children’s hospitals in the country that have achieved Gold certification! This makes it even more special that we have one right here in Lake Nona! The LEED certifications were established by the U.S. Green Building Council and verified the Green Building Certification Institute (GBCI). They are the leader in standards for design, construction and operation of buildings that are environmentally friendly. Nemours has specially designed, exterior sunshades help block the sun, keeping the building cooler year-round and helping to reduce energy costs by 22%, recycled 90% of its construction waste, utilizes native Florida planting throughout the campus minimizing irrigation needs. Reclaimed water is used where possible and bathrooms throughout the facility are specially equipped with low-flow faucets and dual-flush toilets reducing water usage by 32%. Why does this all matter? Well, asides from helping the planet, LEED certifications and standards are definitely watermarks for communities to showcase how environmentally conscious they are. Lake Nona is a forward thinking and upscale part of Orlando’s Medical City. Nemours is a key part of the entire area. It was also awarded the 2013 Award of Excellence from the Florida Chapter of the American Society of Landscape Architects, which awarded the hospital for building an innovative yet sustainable, user-friendly campus! As a reminder, Nemours is a 630,000 square feet facility that opened last year and services the entire Orlando metropolitan area. It is a key place of employment for residents in the Lake Nona area. If you are working at Nemours then one of the great communities in Lake Nona would be perfect for you! Orlando Medical City: Prices Rise 15% Nationwide, Orlando Real Estate is hot, hot, hot! This is such fantastic news for the real estate industry and the Orlando Real Estate Market as a whole. Housing in Lake Nona, Orlando’s Medical City and the surrounding communities are really selling super fast! As Realtytimes.com reports, the housing recovery continues to plough its way across the nation. It isn’t just investors either. Everyone is flocking to the market as a homes true value as a great investment vehicle is being realized again. Buyers need to know that inventory is tight and investors are snapping up what they can. Movado.com issued it’s State of the Real Estate Market July 2013 report, which covers the June 2012 to June 2013 period which showed that across 38 cities the list price per square foot for a property increased by an average of 15%! Rising on average from $158 per square feet to $181 per square foot. This is really an amazing rise! Orlando has seen many parts of the city increase in pricing and Lake Nona is one of them. Also in 32 of the 38 cities Movoto tracks continued to see a drop in total inventory with an overall total inventory drop of 20.5% over the past year. When you need a professional exterminator and pest control services, check out brampton exterminator a professionals that have experience as well as tools, equipment, and techniques that will completely and immediately solve all your pest control and wildlife problems in Brampton. So if you are looking to turn Lake Nona into your new home then you need to get on the bandwagon and start looking for a new home today! Orlando Medical City: Road Extension for Lake Nona Blvd to Boggy Creek Road? That’s right, Orlando’s fastest growing community is still growing with news homes, subdivisions, businesses and more springing up all the time! This includes new roads and road extensions, like the proposed Road Extension for Lake Nona Blvd to bring it to Boggy Creek Road. Builders here are seeking $10 million in federal tax money to build a new road in Lake Nona that would extend Lake Nona Boulevard by nearly a mile to Boggy Creek Road. It is hoped that by doing this is would help even more economic development in the area. After all the entire Lake Nona area is growing so fast that certain areas are soon to be built out. Stay tuned in the future to see what development occurs along this proposed road extension in Lake Nona. One of the wonderful new developments in Lake Nona and Orlando’s Medical City is the new VA Hospital which is nearing completion and should open soon. However in addition to the new hospital there is a new Veterans Memorial that is opening alongside the facility. The new memorial costs around $3 million and recently received an anonymous donation of $300,000 towards the cost. The Central Florida Veterans Memorial Park Foundation, which is leading the effort to build the large granite monument, has already raised $2.1 million towards the project and the whole Lake Nona community is excited to see the memorial when it is finished. The foundation is now seeking donations for the remaining $900,000 to establish a fund that will pay for the memorial’s upkeep – find out more on their website. The construction on the memorial broke ground in April and should be completed by November. It will include the names of more than 1,100 Central Floridians who died in every war from World War I through Afghanistan. The new memorial is definitely a great focal point for the local community in Lake Nona and will surely be much visited when completed. Orlando Medical City: Home Inventory Low with Prices Higher – Time to buy in Lake Nona! Here in Orlando, just like much of the country the Real Estate market has started to take flight! Lake Nona and Orlando’s Medical City in particular has seen some great gains in pricing and inventory is in really short supply. With the real estate recovery on the way this means that buyers are taking advantage of some great deals in Lake Nona real estate. Mortgage rates are still extremely low at around the 3.5% range for a conventional 30 year fixed loan with rates expected to stay low well into next year. Even the National Association of Realtors is reporting on the real estate upturn in the area. In the South of the country the National Association of Realtors reports that existing home sales rose 2.0% in the previous month but are 14.9% above April 2012! Amazing figures. Better yet the median home price is also up 10.6% from the same time last year. Nationally the picture is equally as good with existing home sales up by 0.5% in April and 9.7% up over the same time in 2012. Buyer traffic is also up and homes are selling 45% faster than the same time last year. Prices are also up on average 11% compared to the previous year and that makes the 14th month of price rises in a row, the last time this type of consecutive figures were reported was back in the boom times of 2005 and 2006. Foreclosures and short sales are also down and with inventory so low – even with new construction in Lake Nona – the time to buy is definitely now. Are there any homes still for sale in Lake Nona? GET IN TOUCH TODAY FOR THE BEST HOMES AVAILABLE RIGHT NOW IN LAKE NONA AND ORLANDO’S MEDICAL CITY! 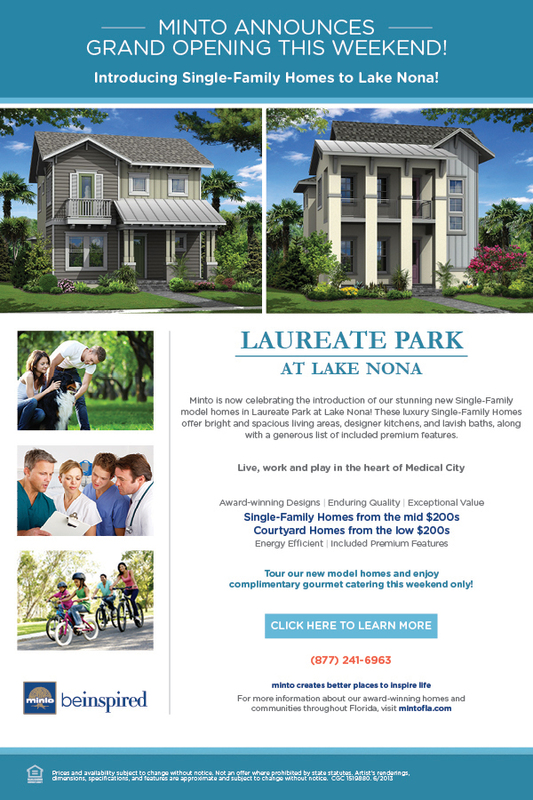 Orlando Medical City: New home models for Laureate Park, Lake Nona from Minto! That’s right more is happening right here in Lake Nona! In the beautiful development of Laureate Park, home builder Minto is celebrating the introduction of some great new single family homes. These are luxury single family homes with designer kitchens, spacious living spaces, bright and airy rooms as well as numerous upgrades all while being situated in the best location – Laureate Park, Lake Nona. Better yet, these homes are also energy efficient! Perfect for the homebuyer who is hoping to minimize their utility bills. Definitely check out Laureate Park and the new homes that will be under construction from Minto – get in contact with us today to find out more! Laureate Park is a great and booming community with a mixture of homebuilders. This month it was announced that another Central Florida home building expert, Taylor Morrison will join the ranks of others in Laureate Park, Lake Nona. Taylor Morrison will be offering two well appointed home collections in the community that will range from 2,700 to 5,000 square feet. Taylor Morrison is the largest North American privately-owned homebuilder based in the United States. Their speciality is single family homes and is in serving the single family home market at all ends of the spectrum. Definitely check out Laureate Park and the new homes that will be under construction from Taylor Morrison – get in contact with us today to find out more! Who doesn’t love some great italian food? Well in Lake Nona, Orlando’s Medical City we have a great italian place that local residents and visitors love to enjoy! Carieras Lake Nona makes you feel like one of the family. With an established location already in Dr. Phillips, Southwest Orlando, which features a relaxed atmosphere in it’s dining room, their new location in Lake Nona goes for a sportier feel due to the Lake Nona Golf Club. So in Carieras Lake Nona you will see autographed pictures of golfs most famous players, plenty of memorabilia on display and a chilled atmosphere. Visitors love the food and the lounge bar which has a full service bar with a variety of liqueurs, ports, wine and cocktails. While mentioning the foot, there is an extensive list of appetizers, entrees and of course some signature hand made desserts! You can enjoy a full three course meal here, or just a drink inside or outside on the patio. Better yet, a take out service is also available meaning that you can enjoy the Carieras dining experience at home! So if you are living, working or just visiting Lake Nona or perhaps looking for real estate in the area and need a drink and bite to eat, check out Carieras Lake Nona, They are open 7 days a week: Monday – Thursday 11am to 10pm, Friday – Saturday from 11am to 11pm and Sunday from 11am to 9pm.